As the 20th century unfolded and the Edwardian era began, fashion was changing and so was the image of the ‘ideal woman.’ There are many attractive women from the era who thoroughly represented the vision of Edwardian beauty. We’ve touched on the lives of Evelyn Nesbit and Lily Elsie, two of the most beautiful and notorious women of the Edwardian era, in previous blog posts. Here’s a glimpse at a few more. 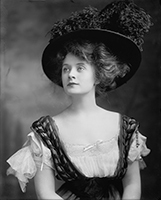 We remember Billie Burke most for her role as the Glinda, the Good Witch from the Wizard of Oz, but she was an actress for a long time already by the time that movie was made. Her father was a singer and clown for Barnum & Bailey Circus. Billie made her acting debut in 1903 at the age of 19 in the London production of The School Girl. She By 1910, she was acting on Broadway. She certainly was an Edwardian beauty!She was soon noticed by Florenz Ziegfeld, who created the Ziegfeld Follies. The Follies featured some of the most beautiful women of the era. She made her film debut in 1915. By 1917, she was a fan favorite, giving Mary Pickford and Lillian Gish a run for the money. She also appeared on radio and television during a career that spanned more than 50 years. Ethel Barrymore was the sister of John and Lionel Barrymore. She was the great-aunt of the actress, Drew Barrymore. When their mother died in 1893, Ethel and Lionel had to go to work. Ethel was only 14. Two years later, she made her Broadway debut in a play starring her uncle John Drew, Jr. She was 22 and an established actress by the time the Edwardian era began. By 1914, Ethel Barrymore was appearing in films. But, working in film was a distant third of her priorities behind her family and stage career. She also had a short-lived career in radio during World War II. She also appeared on television in the 1950s. Here’s a bit of interesting trivia: The next time you watch the 1980 movie Somewhere in Time, look for a photo of Barrymore wearing a nun’s habit from the 1928 play The Kingdom of God. Maude Fealy made her Broadway debut in 1900 at age 17 in a production of Quo Vadis. Her mother was an actress and acting coach and was also in the production. She toured England with William Gillette 1901 and 1902, performing in Sherlock Holmes. Her first film came along in 1911. She appeared in a total of nineteen films between 1911 and 1917. She was also a playwright who co-wrote with Grant Stewart and Alice Gerstenberg. She was also an acting coach, following in her mother’s footsteps. Gladys Cooper was an English actress who made her stage debut at the age of 17 in 1905. She photographed well which made her a much sought after Edwardian beauty. She made her film debut in 1913. She continued to make films and appear on stage throughout her career. Gladys Cooper appeared in the 1942 film, Now Voyager as Betty Davis’ mother. She is perhaps best known as Mrs. Higgins in the 1964 film, My Fair Lady. Looking to create your own version of Edwardian beauty? Please think of Recollections and our collection of Edwardian period clothing. And, of course, “Somewhere in Time” itself was inspired by the most famous Victorian/Edwardian actress of her day, Maude Adams. Author Richard Matheson saw a portrait of Maude in Piper’s Opera House in Virginia City, Nevada, and envisioned what it would be like to time travel back to her. While staying at the Hotel del Coronado in San Diego, he wrote “Bid Time Return” which became “Somewhere in Time”. Maude was world famous – people would travel days by stage coach just to see her perform. She was also the world’s first Peter Pan – Sir James Barrie wrote the story for her after seeing her play Lady Babbie in “The Little Minister”. For more about Maude, visit: https://en.wikipedia.org/wiki/Maude_Adams .